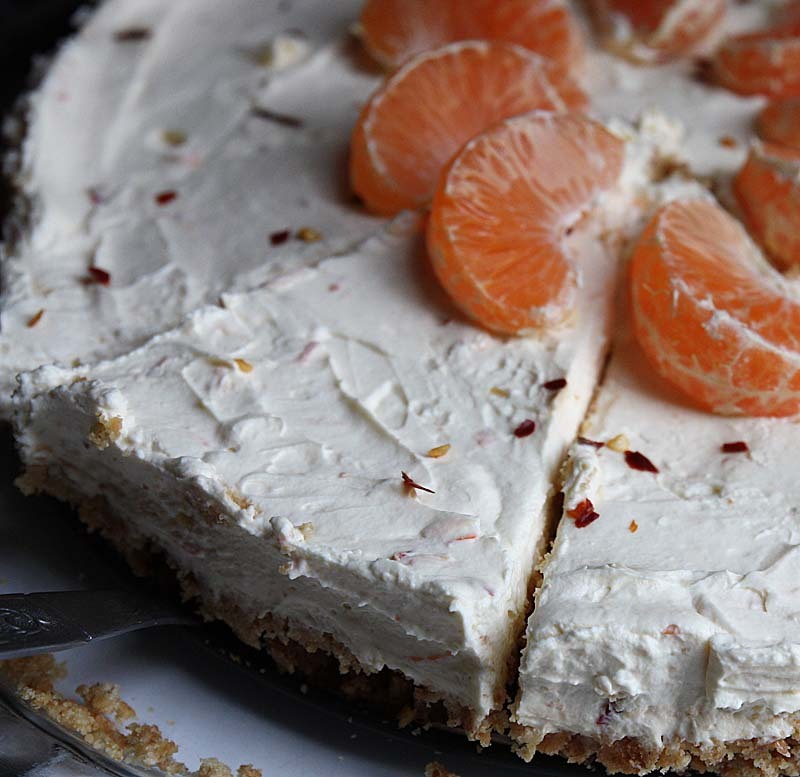 Would you beileve me if I told you that I only made this Clementine and Chilli Cheesecake last night, well I did. 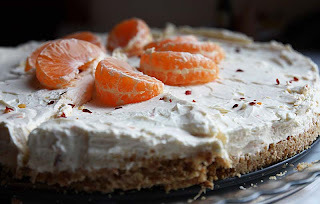 There was a period of my life when I loved indulging in a slice of cheesecake: mango, rhubarb and strawberry being some of my favourite flavours, but then I got sick of the rich creamy cloddy cloy mass and avoided it for years. 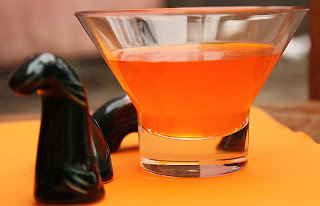 Its only in the last few days, I thought why not give it a go with my favourite spice: chilli and the seasonal fruit of the moment - the clementine! And this Clementine and Chilli Cheesecake was created for your eyes to feast on. Eating my rather large slice was the easy part, getting the first slice out of the baking tin was a tad hard, I had to do it slowly and carefully, in fear that the whole cake would collapse, but it came out well. The sweet flavours of the clementine come through and so does the chilli, not so hot to blow your head off, but subtle to tease and let you know its there in the background. Grease and line the bottom of a 8 inch cake tin and crush all the biscuits in a bowl. Then melt the butter in a pan and stir in the biscuit crumbs. Tip this into the cake tin, spread out and press firmly with the back of a spoon. Chill in the fridge. 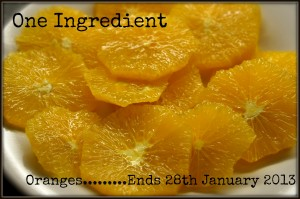 Put the zest and juice of the clementines into a bowl and stir in the sugar until dissolved. Stir in the cream cheese until it is of a smooth consistency. Whip the cream in another bowl, then fold into the cheese mixture, finally fold in the chilli flakes until combined. Then evenly spoon the mixture onto the biscuit base. Smooth out flat, cover with cling film and chill for at least 2 hours; even better overnight. 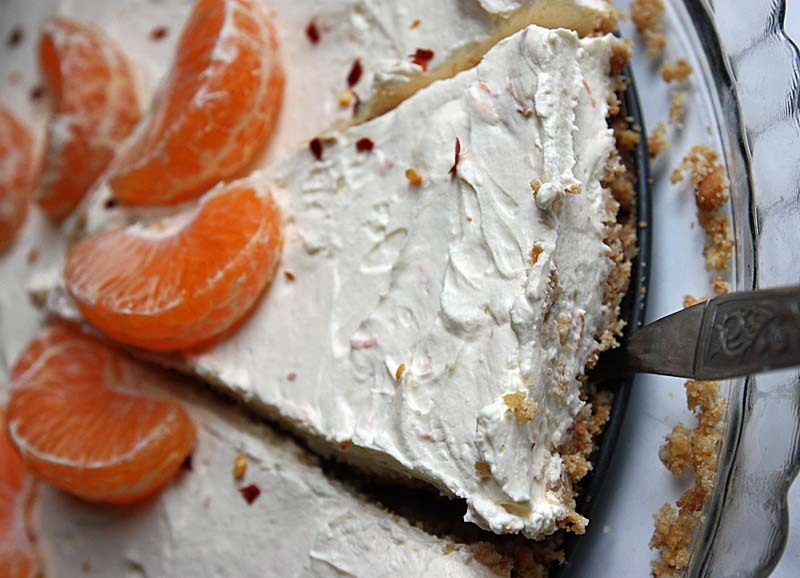 When the cheesecake is set, remove from the tin and decorate with clementine segments and sprinkle of the chilli flakes. Slice and serve. If you are Scottish, forgive me for preaching to the already knowing - but this part of the post is written for my non-Scots readers or those who may not have come across Irn Bru before. Irn Bru pronounced Iron Brew is Scotland's unofficial national drink, a fizzy bright orange non-alcoholic beverage. Such is its popularity in Scotland that not a day went by when I saw a young Scot guzzling it down his throat at the bus stop, as if it were milk. When I lived in Glasgow, I would often witness a young man in a tracksuit on his way to work strutting a large bottle of Irn Bru under his armpits. Or in the evening on my way back home, ned and nedettes eating curry'n'chips and swigging from a can of Irn Bru. Oh such sights I do not miss. I had enjoyed watching the humorous Irn Bru ads though, many of which can be found on youtube. I was also always amused when our American friends come over, they always take back a can of Irn Bru - I am surprised its gets past customs and then surprised it didn't burst on the journey. 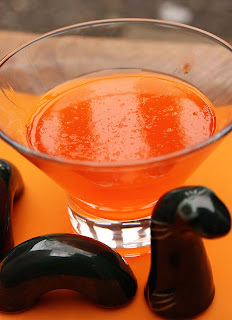 Before I go on to share more about the Irn Bru Jelly, I must make a point about soft non-alcoholic drinks. You know the way some alcoholic beverages are not suitable for vegetarians and vegans, well this can also be the case for soft drinks. 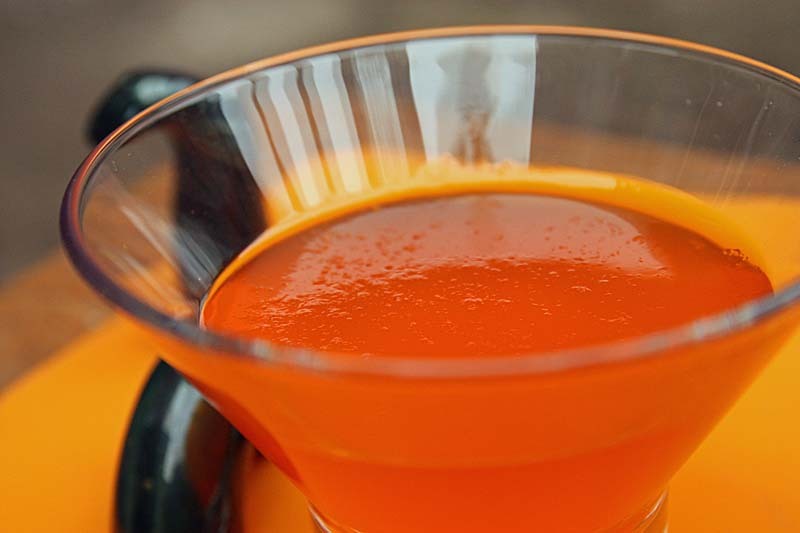 A number of soft drinks for example may use food dyes such as cochineal, which gives drinks a orange glow in the dark colouring. I know it sounds a bit silly, but I would never had thought that sweets contained animal products such as gelatine in wine gums animal rennet in crisps - remember Walkers cheese and onion; and don't get me started with Mars Bars, so nowadays I do my utmost to always check the labels. There is still some uncertainty as to whether Irn Bru is suitable for vegans, but I have been assured that it is suitable indeed. Okay, having acquired my rather large bottle of Irn Bru for Burns Night - my Scottish theme night, I had great plans of creating lots of Irn Bru recipes, such as the Irn Bru ice-cream I had in Inveraray, Irn Bru Sorbet that I had in a Glasgow chip shop, Irn Bru Tablet somewhere in Ayrshire which I thoroughly enjoyed and Irn Bru Cake. However, the only one I managed to create was Irn Bru jelly. Well I was real chuffed with myself, it truly did taste like Irn Bru, the only bit missing was the bubbles, fizz and burps! Maybe for my next Scottish evening I will try Buckfast! I had two Irn Bru glass dishes left from my evening, on hearing this, one of my nephews took one for himself, the other he took home for the family to taste. When I went over I asked them how they found it, my youngest brother was surprised at the idea of Irn Bru Jelly and excited to try it, then he learned that he missed out, so he was a bit mift with my nephew for not sharing a taste with him, so I may just have to make some more again - for a big kids party, his Birthday is in February! Its been a stinky day at work, rain...rain and more rain. After work, especially when I finish a tad early - I usually find my way to my parents and slump on their sofa in front of their fire, not today. I got the bus to my home and jumped pretty much straight away into my pyjamas and the hot water bottle was filled too, oh mustn't forget the coffee. So while I am sitting here, waiting for D to come home. 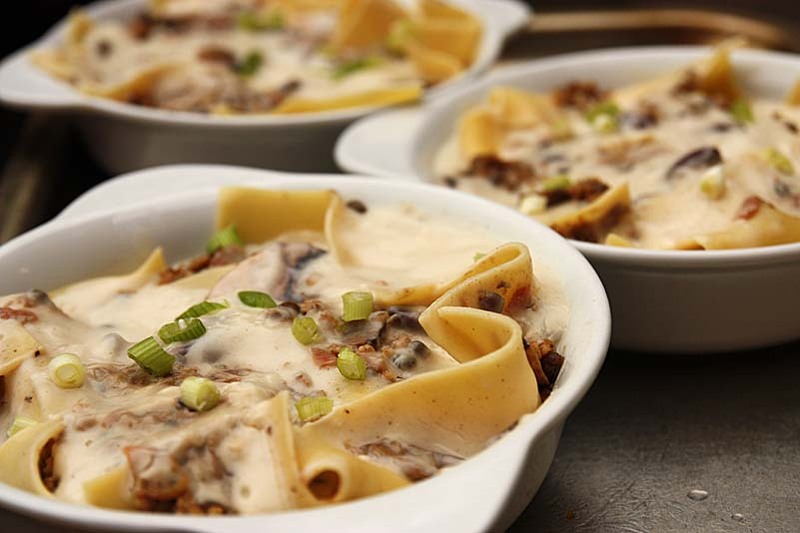 I thought I'd post one of the first recipes from my Burns Night Menu - a Vegetarian Haggis Lasagne. Its been a while since I made and more to the point eaten lasagne, so what a great opportunity to create one to showcase my home-made vegetarian haggis with a Welsh twist. 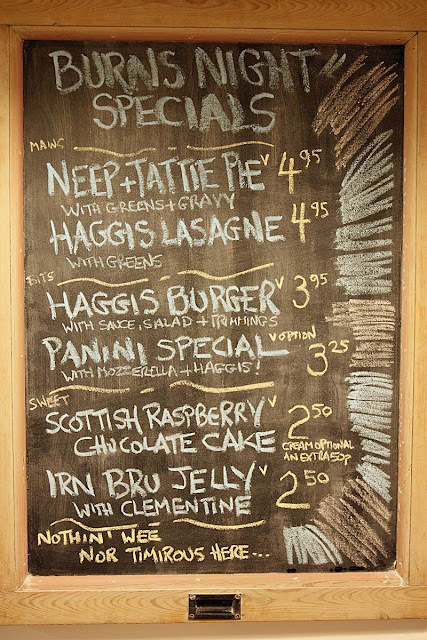 I know nowadays, the Internet is filled with lots of traditional haggis and vegetarian haggis based recipes from the likes of McSween the biggest haggis producers in Scotland, as well as Scottish food writers: Sue Lawrence, but for me I owe my further enjoyment of vegetarian haggis to Johanna. I remember only five - six year ago when I lived in Scotland, you just couldn't find a good vegetarian haggis based recipes on the internet and when you did, how to incorporate it in other recipes. 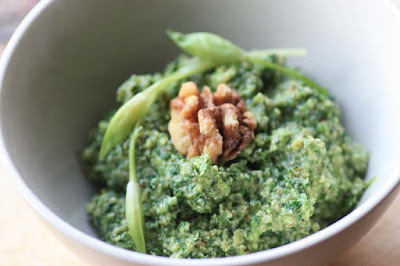 The one place on the Internet where I did find some inspiration was Johanna's blog Green Gourmet Giraffe (a year or so before I began my own blog) I even remember one of the Scottish national papers there, acknowledging her website as a source of haggis recipe inspiration. Since discovering Johanna's blog, we have become good blogger friends and she has continued to create many other vegetarian haggis delights - such as haggis,neeps and tatties pasties, and haggis nachos which I think I may have to have later this week as I still have some haggis to use up. 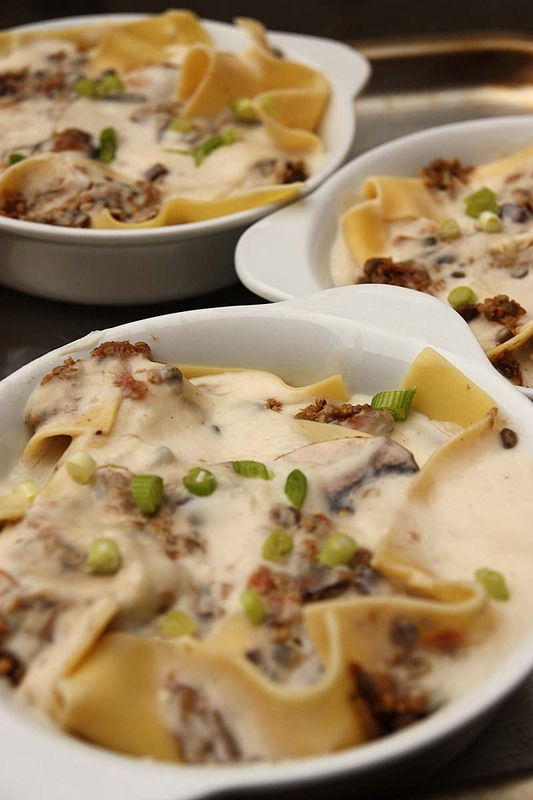 Anyway, my Welsh Haggis Lasagne is very earthy looking dish, almost autumnal - except its the winter season here. For the Welsh twist, I've added some leeks in place of the onion. I've also added some meaty Portobello mushrooms to my haggis, this was mainly to give it more texture for the guests that were more used to eating meat, so its an optional extra. It was enjoyed by everybody who had it, including me. I liked the differential texture of the haggis, the oozyness of the bechamel cream and the chewy baked bits of the lasagne sheets and the just burnt crisp cheese. 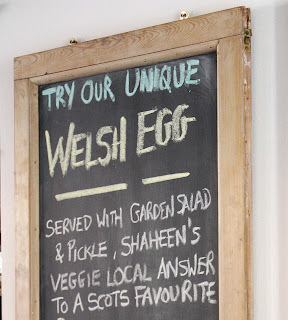 To my knowledge, Welsh faggots are referred to as Welsh Haggis. Faggots were traditionally made with the innards of pigs. The pate like mixture is then wrapped in the lacy casing of the animals caul and oven roasted slowly, just like Scottish Haggis. there may be some truth in this as The Scotsman also make reference to haggis being popular in the Welsh Valleys of Wales, but they still credit the Scots for the haggis jokingly writing that a Scottish haggis escaping to Wales in 1690, hence its popularity in Wales. What's the weather like where you are? Here the snow has finally melted away, replaced by incessant cold sleet rain. Moments ago, there was even thunder and lightening. I am so glad I am home dry and warm. 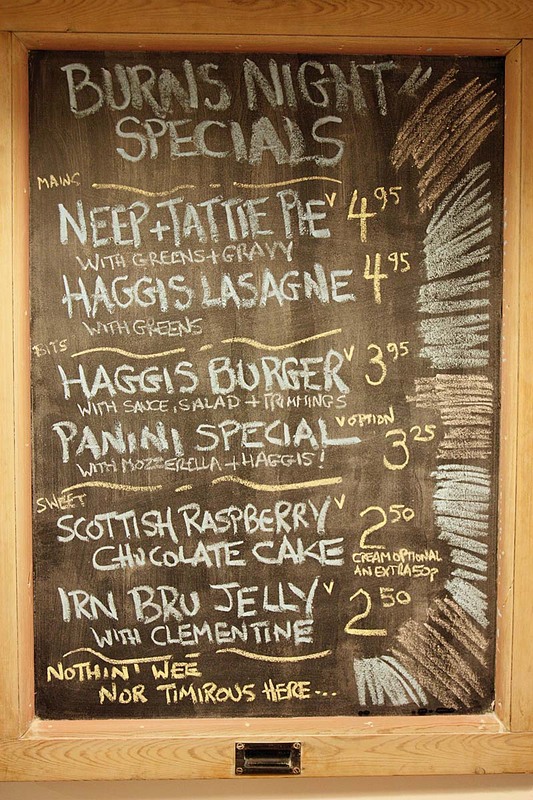 On Friday 25th January, I had a 'Burns Day and Night Menu' on offering. Amongst my creations: Vegan Haggis, Neep and Tattie Pie, Spicy Neep Samosa Pies, Vegeterian Haggis and Portobello Mushroom Lasagne, Vegan Haggis Burgers, Scottish Raspberries and Chocolate Bundt Cake and Irn Bru Jelly. I haven't got round to downloading those photographs yet, so today its another cake to feast your eyes on. 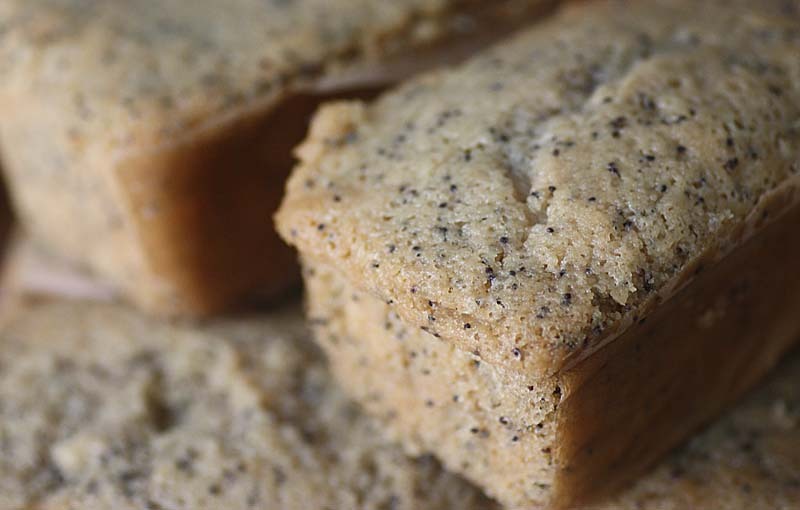 For those of you who read this blog, I must let you know that this is exactly the same recipe for the Lemon Poppy seed mini loaf cakes, except her I have used orange zest and juice here. I don't know if I mentioned in the Lemon Poppy seed cake post, but this recipe can be a bit hit and miss. This time the batter did not rise as much as it should have, so these were a little on the slender side, so I sandwiched two cakes together with marmalade to give it more height and appeal. 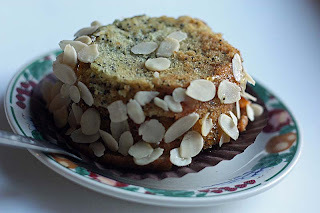 This is the second time this month that I am sharing a Orange flavoured recipe with Karen at Lavender and Lovage and Kate of What Kate Baked for their Tea Time Treats. 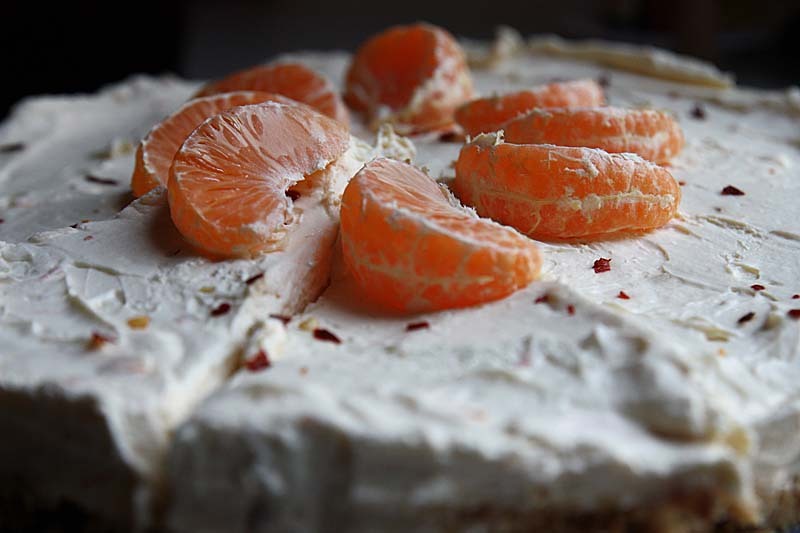 The theme for January is citrus; as well as One Ingredient with Laura of How to Cook Good Food and Nazima of Franglais Kitchen who are featuring on orange this month. Line 8 - 10 mini round cake/tartlet tins. Combine the first 4 dry ingredients together, then stir in the wet ingredients and zest. 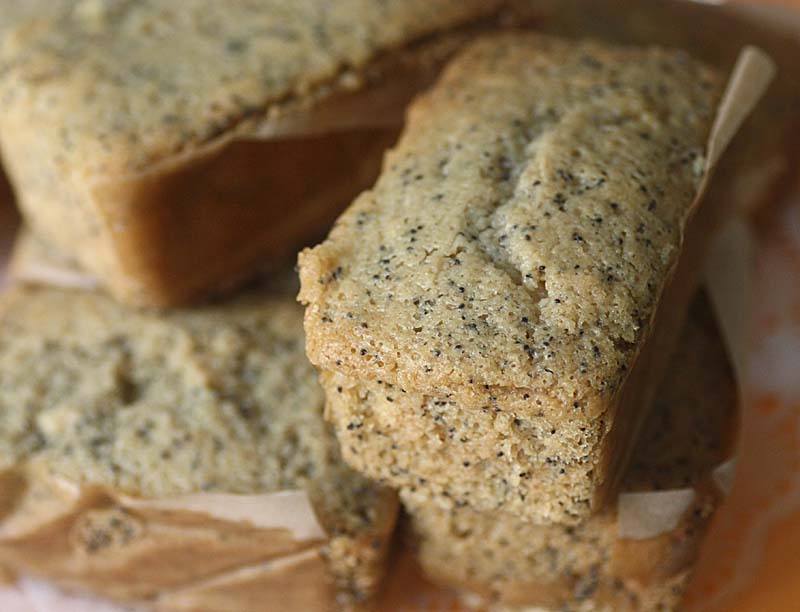 Gently and evenly fold in the poppy seeds. Carefully pour into baking tin/s and bake for 20 - 25 minutes for the smaller versions or 35 - 40 minutes for larger cake. Bake until golden, risen and firm to the touch. When cool, turn them out of the baking tins. 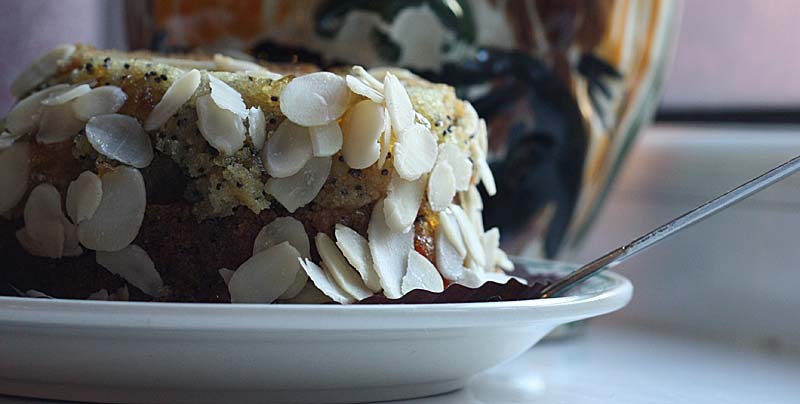 Optional: using a spatula, generously coat the sides of the cake with marmalade and then stick the lightly toasted almond flakes to the side. These are best eaten within a couple of days. Well the snow just keeps on falling, and we all want to stay indoors and stay warm...well I do. I would be a fibber if I said I did not get any cookbooks last year. It is true that I have made no new purchases - regardless cookbooks have still been finding their way into my home via the local library, but that didn't last long as D confiscated my library card when I failed to return my bundle of books not once, not twice, but three times in a row and the fine being just over £30.00 pounds. Needless to say, I haven't been back to the library since August. The other way I have acquired some cookbooks is secondhand; through charity shops of which there are many mushrooming all over where I live now. I will share with you some of my secondhand cookbook acquisitions, but one of the cookbooks, I was really delighted to get my mitts on was Positively Vegetarian by Demuths Restaurant especially now that it is out of print; and one of the recipes that leaped out to me immediately was one for Red Wine Goulash. 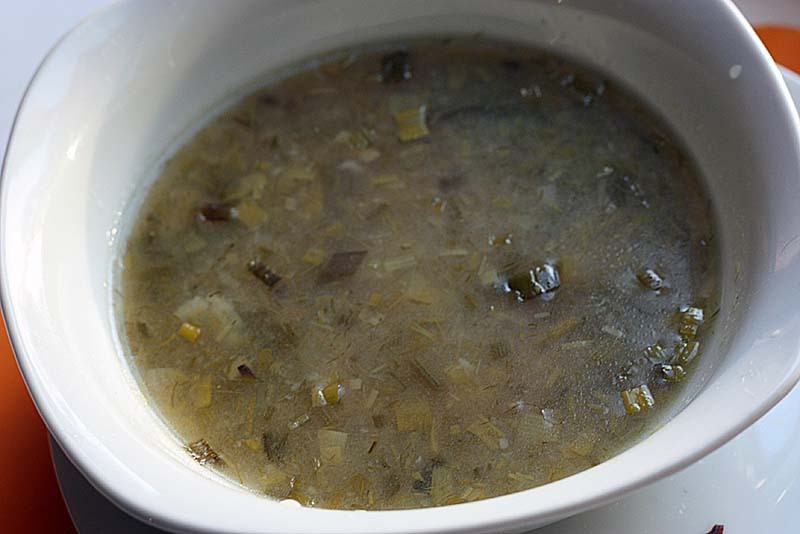 Soup has been on the table aplenty the past couple of weeks, but now it was the turn of something with a little bit of kick to spark us up and chase the blues and the chills away, well for a little while at least. 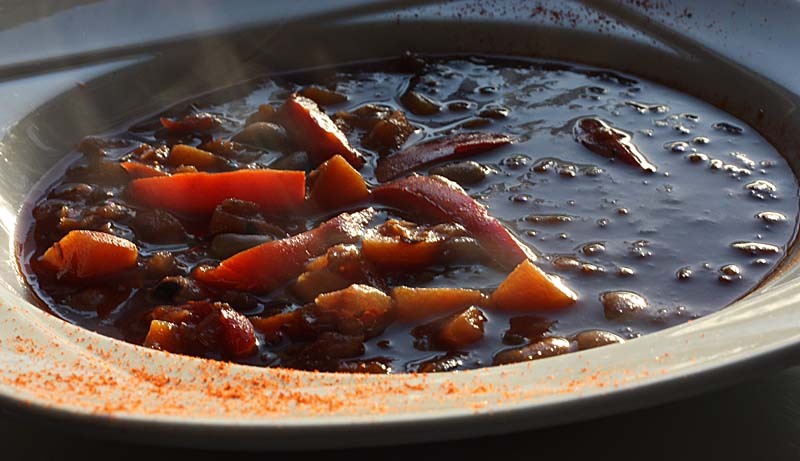 This Hungarian stew, often made with meat, but here it is made with some vegetables and pulses. 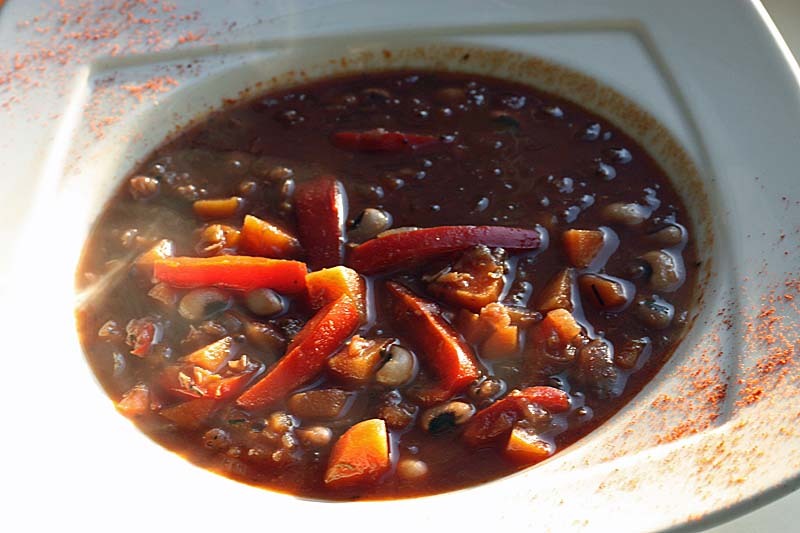 The fiery colours of this dish will set your insides a little aglow and the gentle waft of the smoky, spicy paprika will tickle your nose. You can eat this just as it is, but I served it with plain white rice and a dollop of soured cream. I am sharing a hot bowl of this Red Goulash with Javelin Warrior's for his Made with Love Mondays. 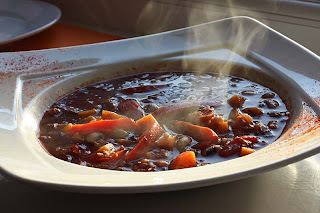 I am also sharing this recipe with Jacqueline of Tinned Tomatoes who is hosting January 2013 Edition #20 of Bookmarked Recipes: a monthly blog event initiated by Ruth of Ruth's Kitchen Experiments. This dish is best made a day in advance. Soak the black-eyed peas overnight in plenty of water. The next day, drain and cook in fresh water until tender. Drain and set aside. I have not been on a Parsnip Trip for a while, so that is the vegetable I chose to incorporate in my next cake made especially for my oldest niece celebrating her fourteenth birthday - a Retro Parsnip, Hazelnut and Violet Cake. It took a while for the birthday girl, and my other two nieces to be both brave and tempted by a slice. I don't know if it was the thought of eating parsnips in a cake frightening them or the way I had dotted the parma violet sweets on top of the cake making it look a tad tacky, rather than retro. Regardless, I was pleased of it and knew if only they took one bite of it, they would like it - if not love it, and when they did - oh my goodness it disappeared from the cake stand as if by magic. When I could not find my stash of crystallised violets, I had to make do with the floral scented parma violet sweets only to serve as eye candy. You can happily omit them if you so wish and I think I would too the next time I make this cake. 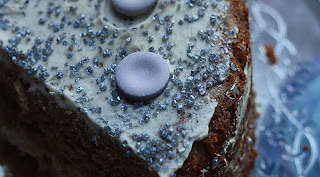 I also had some purple sugar which I scattered over the cake like fairy dust. You can easily substitute the hazelnuts with walnuts or pecans if you wish, I only used hazelnuts as they were fast approaching their best before date, and nuts are too expensive to throw away. 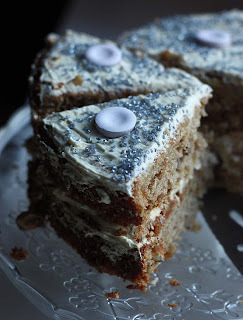 Just look at the soft caramel coloured texture of this cake... makes me swoon. 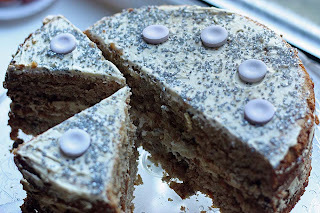 I am sharing a slice of this Parsnip, Hazelnut and Violet Cake into January edition of Simple and In Season, a monthly event created by Ren Behan at Fabulicious Food, who is also this months host. Preheat oven to Gas mark 4. Grease and line with baking parchment paper 2 x 8 inch sandwich tins. Melt the butter and sugar in a pan over gentle heat, then cool slightly and stir in the violet syrup. Gently whisk the eggs into the mixture, then stir in the flour, baking powder and cinnamon. Follow this with the grated parsnips and hazelnuts. Divide the mixture between the tins, then bake for 30 - 35 minutes. Allow the cakes to cool before turning out onto a wire rack. Whip together the double cream and the violet syrup. Spread most of it over one cake and sandwich with the other. Then spread the top with the remaining violet flavoured double cream. Scatter over some crystallised violets, purple sugar or top with Parma Violet sweets. Adapted from my Parsnip Cake recipe. The Met Office issued a rare red weather alert for parts of South Wales with up to a foot of snow to fall - and it fell softly, yet heavily. I got up this morning with good intentions of going into work. Well we managed to get out of the driveway, through the first road then our small little car struggled and could not manage the uphill road, sliding as we drove. We dare not risk it further as there were more hills to contend with on the journey. D managed to turn the car around and we made ourselves back to the comfort of our home. We ventured out for a little walk for fresh air, but that was it - no building of snow-people, though we did see many on our walk. Our nibbles today have been mainly bread (made in the bread machine) with butter, with jam and pate. I have to admit our kitchen cupboards are pretty empty. The only two things we had warm today was a Christmas cake steamed up with custard and non-alcoholic mulled wine, I swear there must be alcohol in it, because its made my cheeks so rosy and made me feel cosy warm and a little drunk too. D has been on the computer most of the day as he got a text message saying not to come into work, so he has been hogging the computer. I have just managed to get it in the last 30 minutes or so, and have decided to post this Leek and Potato soup recipe. I made this last week around the same time I made the Aloo Chaat Masala Burgers with the left over mashed potatoes from my Bubble and Squeak cakes. I thought it was a good recipe to submit to this months edition of No Croutons Required which is hosted this month by Lisa at Lisa's Kitchen as the theme this month is leftovers. Gosh I can hardly write a recipe here, as this was made on the hoof with what I had to hand as I hate waste, but here goes. Heat 2 tablespoons oil, add 1 medium onion minced and saute, then add in 2 medium leeks, washed and minced and saute until soft. 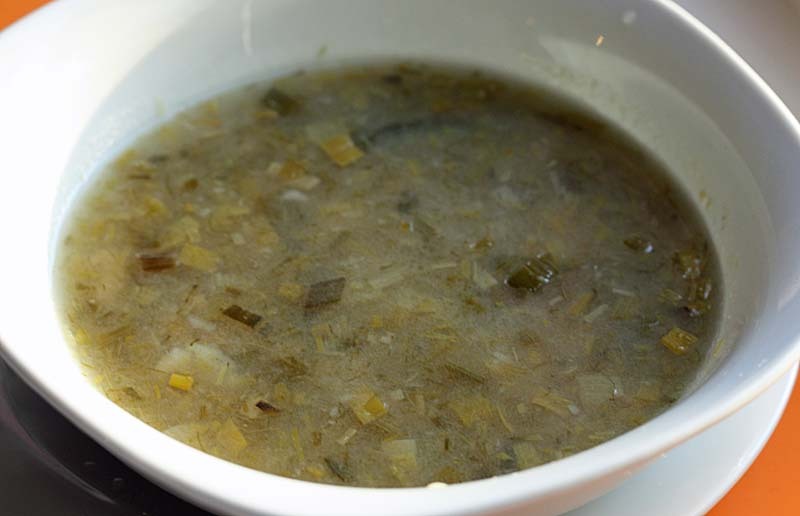 Add 400ml - 600ml vegetable stock and bring to the boil, stir in 200g cold mashed potatoes and simmer for 15 to thicken. Season with salt and pepper to taste. Add a 400g tin of drained and rinsed white beans towards the end and simmer to heat though. Taste and adjust seasoning if necessary and serve immediately. 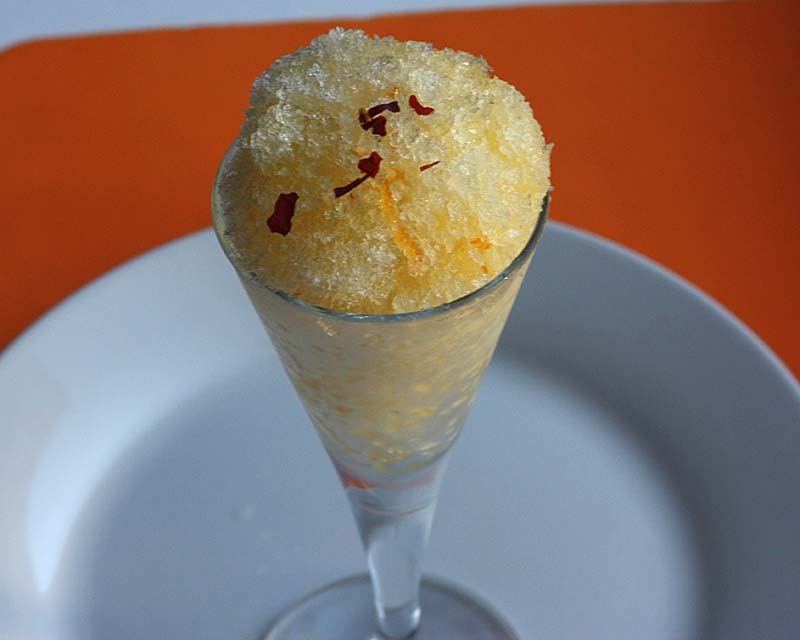 I know its snowing heavily in some parts of the U.K, and the last thing some people want to see is a recipe for something cold and icy, but in my defence the flakes of chilli in this granita will give you a little warmth, if not a little fire. This recipe is an adaptation of my Lemon and Rosemary version; and its proved to be quite popular amongst my taste testers - the young nephew and my husband - the chief taste tester. I also made a coffee version of granita but that did not go down so well, main criticism for that one was it was not strong enough, fair enough. 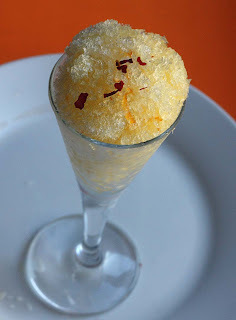 I am sharing this Orange and Chilli Granita with Karen at Lavender and Lovage and Kate of What Kate Baked for their Tea Time Treats. The theme for January is citrus; as well as One Ingredient with Laura of How to Cook Good Food and Nazima of Franglais Kitchen who are featuring on orange this month. Gently bring all the ingredients to a boil, stirring frequently until all the sugar has melted. Simmer for a couple of minutes, then remove from the heat and leave it to cool. When cool enough, pour into a suitable plastic container and freeze. Freeze, then after an hour or so take out of freezer and blend in food processor, pour back into container and freeze for another hour or so, then remove from freeze and blend again. 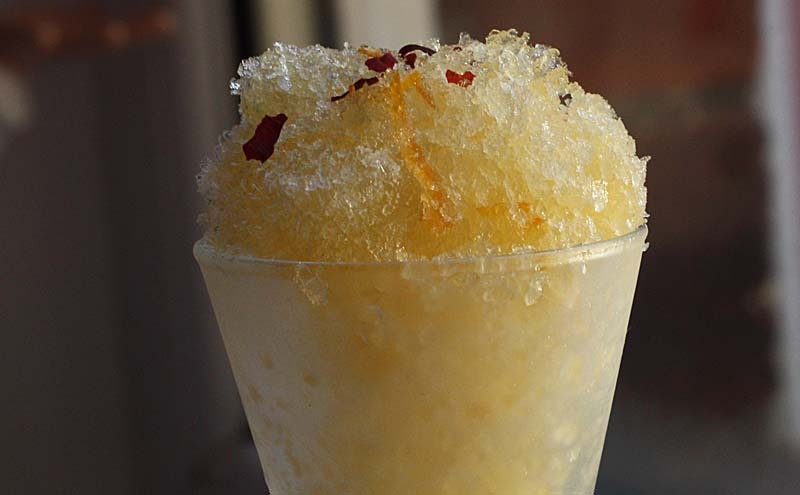 This is to ensure that there are no mass of ice, but soft crystals. Then freeze. Twice should be enough, but you may want to do it a third time if you want softer crystals. 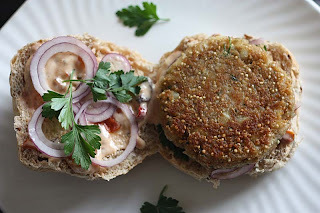 I created this Aloo (Potato) Chaat Masala Burger last week when I had a load of mashed of potatoes left over from a Bubble and Squeak cakes. Rather than waste them, I incorporated them into two dishes. The first was a 'White Bean, Leek and Potato Soup'; and the second this - Burg Aloo Chaat Masala (Burgers). They proved to be quite popular. Although my mother didn't get to try one, she said that the flavour combo appealed to her. Its the chaat masala that appealed to her senses. I don't know anyone who makes there own Chaat masala, most South Asian families buy it ready made. Its basically a zingy, sour and spicy versatile all-purpose seasoning that enhances fruits, salads, vegetables and potato based snacks, which is how I tend to use it - to perk up crisps, chips and even popcorn - yes Chaat Masala popcorn, ones of my Friday night snacks. For those of you new to Chaat Masala the ingredients that make it so, include asofoetida, bay leaves, black pepper, caraway seeds, cardamon, cinnamon, cumin seeds, ginger, mango powder, red chilli, star anise and salt. I had a bit of a lazy day today, even the blue skies that promised not to shed a drop of rain could entice me out. My Sunday morning was spent in the warmth of my bed: re-energising for the coming week. When I did finally get up, I spent most of it in front of the computer, not surfing the cyber world for pleasure but catching up with e mails, invoices and such things. Also , thanks for those of you who told me about Chrome Google, its been downloaded and has made uploading photographs so much easier, especially as blogger is still playing up. 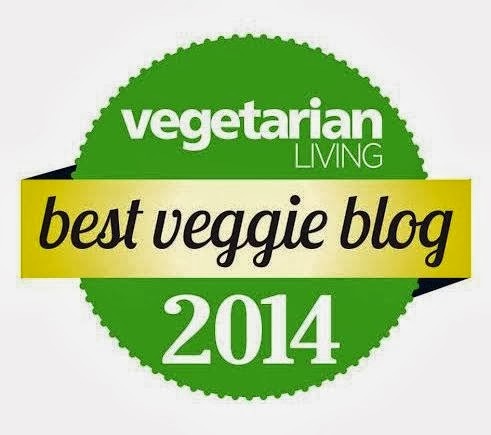 I have to admit, regardless of this technical hitch, I have not got my blogging mojo back proper yet. I am finding that the words are not coming easy as they used too. I am not too sure what to write about too. Of course I know some of you are all interested in what I have been cooking, but I know too that some of you are also genuinely interested in what is going on my life too and my work situation too, but things are not on the up there and are bringing me down a little, so I don't really want to focus on that so much yet. So I guess at this point, I better quickly share another vegan cake recipe. 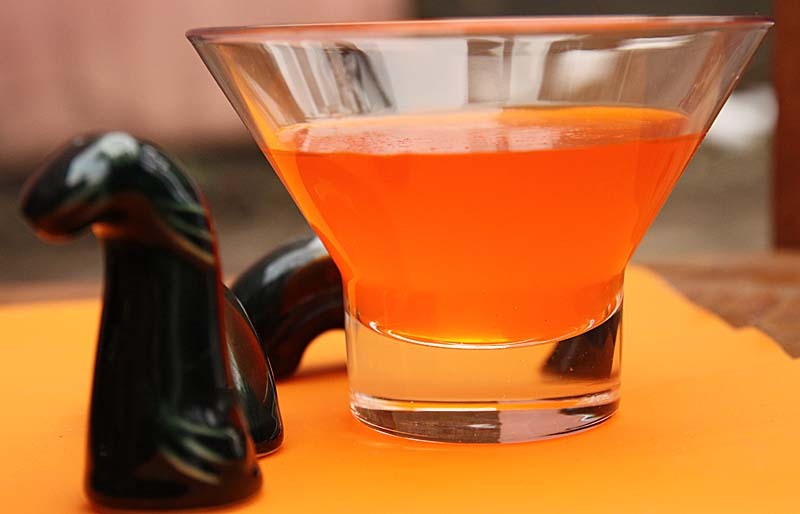 Over Christmas I used the edible hibiscus flowers for my non-alcoholic drinks served in fluted wine glasses. 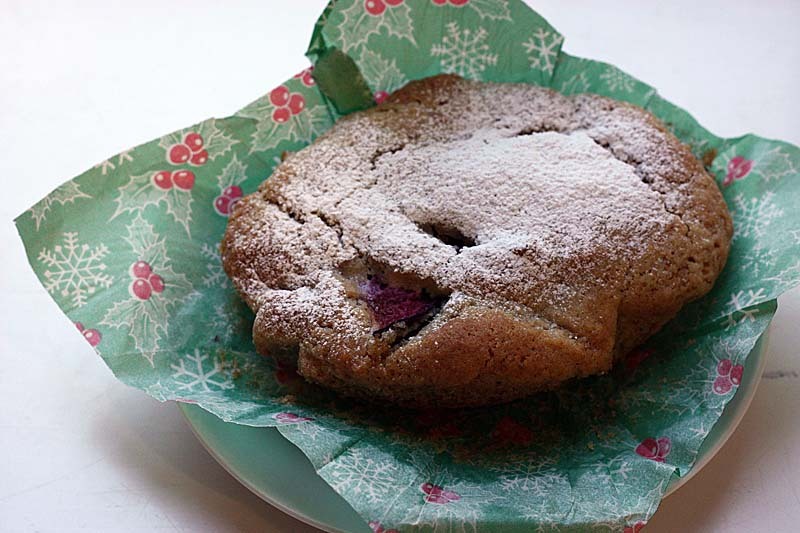 I had some left over, which I decided to incorporate into these cakes which were baked these in oval pie tins. I normally make these cakes with rhubarb, and I do have some home-grown chopped and ready to go stashed in the freezer, but plums it was to be when I was given some by my mother who picked up too many to eat. 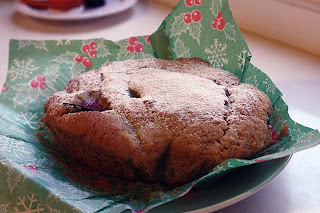 The juices from the plum oozes a little into the batter and the hibiscus flower flavour is subtle in the background. The texture of this cake is that it is soft on the inside and the top is shortbread like. I doused it with a little icing sugar to appeal to the eyes too. In a large bowl, sift together the flour, baking powder, bicarbonate of soda and salt. Stir in the flaxseeds, sugar, oil, juice, plums and chopped hibiscus. Stir gently until just mixed. The mixture will seem dry, but don't worry, it will moisten with the plums. Spoon into a lined individual baking tins and bake for 25 -30 minutes. Test with a skewer to see if done. I have finally changed my mind and decided to open an account with Twitter - see my side bar, if you would like to follow my occasional tweet...and I promise, it will be occasional. I hope to be back tomorrow with another recipe. I know some of you have made resolutions to lose a few inches from your waistline, so please don't be too mift with me with what I am about to share with you - a rich decadent chocolate brownie made from sweet potatoes and cranberries. Its based on the Beetroot Brownie recipe featured on my blog last year. I figured I'd have a go at replacing the beetroot with sweet potatoes this time- Isn't that how lots of (acclaimed) bakers get their ideas, thinking outside of the box, except I am not a baker, well not a real baker, but an experimental cook and this substitute worked fabulously. I don't rave too much about chocolaty things, but oh my goodness, these are terribly good treat for your eyes, mouth, tongue and tummy - just not for your waistline. For those of you who want to curb your curiosity, a small piece will suffice, not a whole slice or bar of brownie as I'd like to call it - that would surely make you faint with joy. I've actually been terribly good over the festive period not over-indulging in rich, decadent food. The odd chocolate piece has passed my mouth, but other than that its been plain and simple. The orange of the sweet potatoes gets completely lost in the cooking of the brownie, in fact you would not know sweet potatoes was a key ingredient in this recipe. If you do get round to making it, please let me know what you think. I am entering this recipe into Javelin Warrior's Made with Love, Mondays recipe round up of from-scratch recipes: and into December -January editiion of Simple and In Season, a monthly event created by Ren Behan at Fabulicious Food. This month it is being hosted by Karen at Lavender and Lovage. Makes 10 squares if you want big indulgent greedy slices; or15 pieces if your being very good. Preheat the oven to gas mark 3/170oc. Lightly grease a baking tin that's roughly 8 inch by 8 inch. Line the bottom with baking parchment paper too. Put the cubed butter and chocolate into a bain marie or heatproof bowl and melt the chocolate and butter in the bowl held over a pan of simmering water. In another bowl, whisk the sugar with the eggs. Stir in the melted chocolate mixture. Sift in the flour and salt, stir gently, folding in the grated sweet potato and cranberries. Pour carefully and evenly into the prepared tin. Bake for 25-30 minutes. Be very careful not to overcook the brownies. Remove from the oven, then stand the tray on a wire rack until cool enough to cut into squares. Adapted from this recipe previously posted on my blog. I forgot to post the vegan chocolate cake recipe up on this post and some of my lovely readers have gently reminded me of this omission, so this has given me another excuse to post another variation of that vegan chocolate cake, this time topped with fresh clementine pieces and fresh cranberries. This cake can also be topped with dried fruit or just dark chocolate buttons. I have had positive remarks about this vegan chocolate cake from many people who are vegan, saying its one of the moist vegan cakes they have ever had. Unlike some vegan cakes that are just too heavy and dry on the palette. Heat the oven to Gas Mark 5. Oil an 8 inch round baking tin. In a large bowl, sift the flour, cocoa, soda, salt and cinnamon. Stir in the sugar. In a small bowl, combine the coffee with the oil and whisk. Then beat the liquid into the dry ingredients, then quickly stir in the vinegar. Pour the batter into the prepared pan and top with clementines and cranberries. Bake for 30 – 35 minutes for larger cake or 25 minutes for smaller versions, or until a toothpick in the centre of the cake comes out clean. 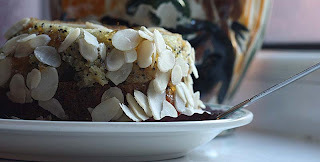 Another one from last years unblogged archive of photographs and recipes. 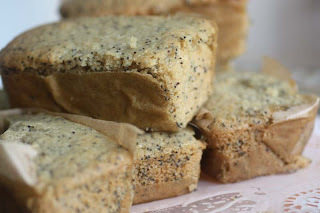 For some reason, these vegan Lemon Poppy seed cakes are not as popular as my vegan Chocolate cakes, maybe I just need to gussy them up with some glaze, icing or frosting. I've even considered slicing them in two and filling it with lemon curd, but then it would not be suitable for vegans. I still continue to make them, hoping that their lightness and gently sweetness will win some hearts, but no - they tend to get ignored. I often make these vegan Lemon in mini loaf pans and it yields 12 mini loafs, but you can try and make one large tray bake . As for the Vegan Orange Poppy seed Cake in little round baking tins, a little more appealing to the eyes. I honestly don't know where I acquired the recipe, I found it a scrappy hand-written A4 paper tucked in one of my early vegan cookbooks: 365 plus one Vegan Recipes reprinted as Easy Vegan Cooking. Anyway, I've adapted this recipe a little further, just by substituting the lemon juice with fresh orange juice. I am still having problems downloading images onto my blog, this images for this blog entry had been uploaded last week. Line a 9 x 13 inch baking tin or 12 mini loaf tins. I was very disappointed in myself in that I did not get round to making my own Chocolate Yule Log for the festivities. It was something I had planned and was actually looking forward to making - just time got the better of me. I did however get round to making about a dozen mincemeat pies from scratch each topped with star shaped pastry lids including the vegan mincemeat filling. Anyway, as well as the mincemeat pies which after a while lose their festive appeal, I decided to use some of the mincemeat in some flapjacks, a good decision, I have to say as I preferred them much more to the mincemeat pies. These mincemeat flapjacks sliced handsomely and to boot, were quite tasty and fruity sharp. I am not expecting you to go out now and make this mincemeat recipe from scratch, but if you do have some mincemeat left over in jars, well why not think about making this flapjack recipe or even my Mincemeat and Apple Crumble Tart (see side-bar). 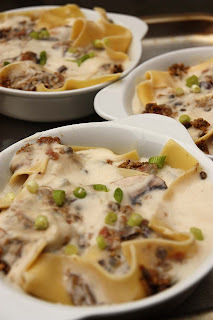 I am linking this recipe with Jacqueline at Tinned Tomatoes. 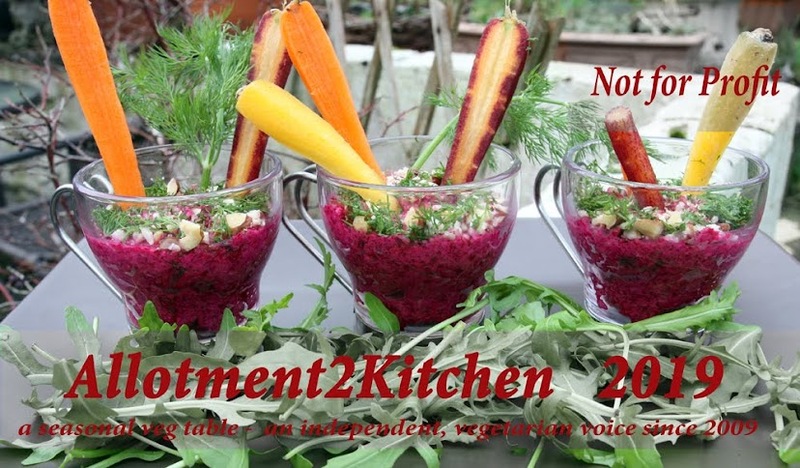 Jacqueline is hosting January 2013 Edition #20 of Bookmarked Recipes: a monthly blog event initiated by Ruth of Ruth's Kitchen Experiments. 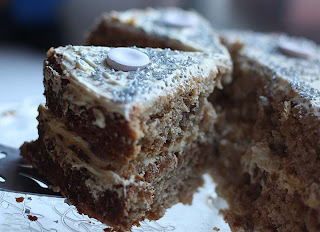 Before I go , I wanted to share whilst catching up on my blog -reading, I noted that fellow blogger Kath at The Ordinary Cook had also made some Mincemeat Bars - see here for her tasty version. Preheat oven to gas mark 4 or 180oc. Grease a medium sized baking tray about 8inch by 8 inch square. In a large saucepan, melt the butter, sugar and golden syrup.Take of the heat, then evenly stir in the oats and the prepared mincemeat and a handful of dried cranberries. Simply mix all the ingredients in a bowl. Leave overnight for the flavours to meld then its ready to use straight away. Adapted from Rose Elliot - The original British Queen of Vegetarian Cooking. The original recipe can be found here from The Guardian. I really wanted the first recipe of the year on my blog to be one that was celebratory and bedazzling to the eye, but I have not had the camera to hand every time I have cooked something new. So I have had to dig into last years archives of unblogged recipes and have chosen to share with you my Welsh Glamorgan Eggs. I created these Welsh Glamorgan Eggs around the same time I made the Caerphilly Cheese, Leek and Potato Pie. Its based on the Scotch Egg, I've featured my Vegetarian version of a Scotch egg on my blog in the past made with mushrooms - see here for link, so it was inevitable, I would end up making one upon my move back to Wales. 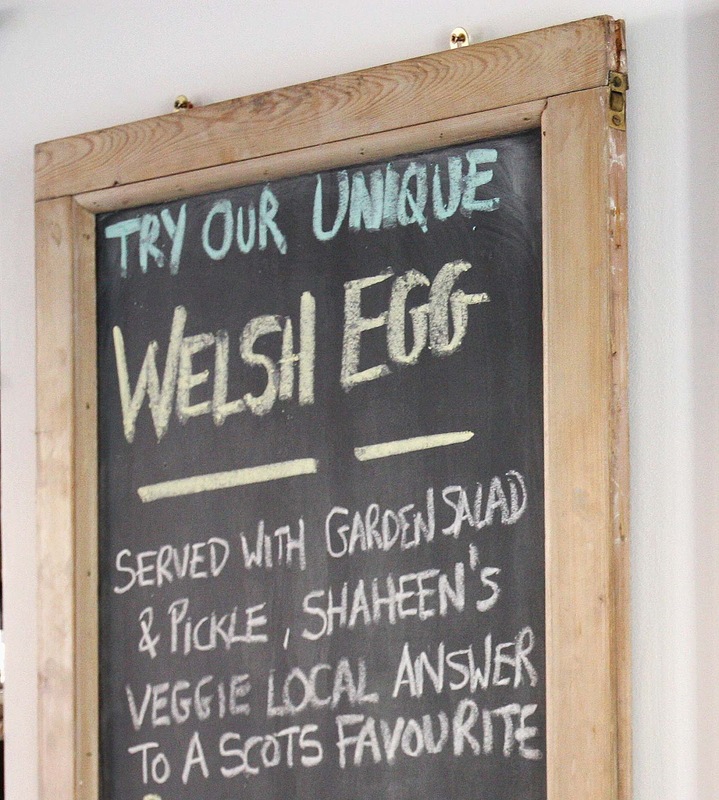 Scotch Eggs, Welsh Eggs are not that difficult to make. Once you've made the sausage-meat, its all about being patient with the moulding and careful with the deep-frying; and I have to say home-made is lovely, because you won't get that crispy golden crunch anywhere else. I'm intending to showcase these Welsh Eggs again around St Davids Day in March, so I promise to cut one open for you so you can see not just the hard boiled egg, but the Glamorgan vegetarian sausage-meat clinging onto the egg. I am also planning to make another one called Red Dragon Welsh/Scotch Egg, why? There may be some red chilli flakes in there or maybe some Welsh Red Mustard! Coming soon - wait and see. These were simply served with home-made piccalilli, pickles and a light green salad. 1 large egg white lightly beaten or whisked (optional - I like it whisked as it gives it a tempura like texture). Roll the eggs in the chickpea flour. Place 150g breadcrumbs in a large mixing bowl along with the onion, cheese and herbs. Then add the mustard powder and seasoning of salt and pepper. Now add the egg yolk and stir to bind together. I tend to use my hands. Then divide the mixture into four equal portions and then using your hands begin moulding the Glamorgan sausage meat around the egg, squeezing gently to hold and bind it together, ensuring that there are no gaping holes. Mould gently until you have a nice firm and well covered egg. Put in the fridge to chill. When ready to deep fry, whisk the egg white, dip the eggs in it, then roll gently into the panko or fresh breadcrumbs and deep fry until golden. Just a simple blog entry to wish all my readers: past, present and those who are new to my much neglected blog. May I wish you a Happy New Year.